Minutes after booting up Forever Lost, I felt like I'd gone back in time. Here my protagonist was, waking up in what appeared to be a mental asylum, with no memory of who he (or she) was or how he (or she) got there. Single screens. A camera. Sliding-tile puzzles. Weird writing on the wall. A journal. 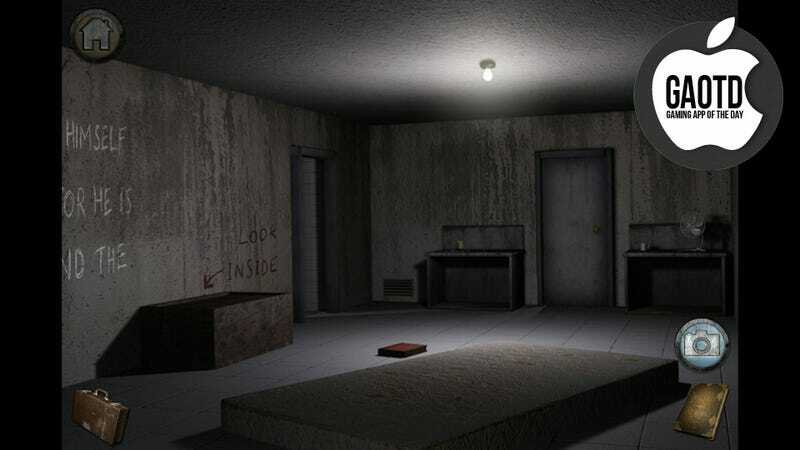 You may not have been in this room before, but if you've played many adventure games, you've been in rooms like it. From there, Forever Lost follows a familiar but not unwelcome template—move from room to room, gradually solving environmental puzzles using the clues gathered throughout the asylum while slowly piecing together just what the heck is going on. It's not unlike Myst or perhaps Phantasmagoria; it's a throwback to a time where walking from one interesting room to another while figuring out riddles was enough to keep us occupied. As it turns out, it's still enough to keep us occupied—in fact, the game occasionally displays a welcomely sardonic sense of humor, and there are some great little references and meta-jokes hidden in the game's puzzles. Unfortunately, there are a number of bugs—notably that sometimes the touch screen would stop responding, but a patch was just issued that hopefully mitigates some of that somewhat. Forever Lost is only the first episode in a planned series, but while it's not particularly lengthy, it's worth giving a run. Old-school adventure fans will find a lot of good (occasionally very funny!) nods to their gaming roots, while newcomers on mobile devices will find a world filled with brain-teasers and at the heart of it all, a mystery that just might be worth solving.